Some may have started as far back as the 60’s but the fab 5 that hit the stage at Bendigo on Saturday night could show todays youth a thing or two. On parade were ARIA Hall of Famers, international hit makers, a former TV Week Queen of Pop and countless number one hits. APIA truly brings songs of a lifetime to the modern era. Each artist Brian Cadd, Marcia Hines, Russell Morris, Leo Sayer and John Paul Young a star in their own right. Another interesting point all artists came up on Australian stages learning their craft in front of an increasing live audience. Countdown was paramount to all artists career, throughout the concert Molly Meldrum was referred to fondly. Brian Cadd kicked off the night singing four of his biggest including “Your Mama Don’t Dance”, “Let Go”. Before giving the audience an insight into his experience at the 1972 Tokyo Songwriters competition with a group at the time of four unknown Sweds (ABBA). “Don’t You Know it’s Magic” not only won that competition but was also a hit for John Farnham. “Ginger Man” finished of Cadd’s set. Enter John Paul Young “I Wanna Do It With You”, “Pasadena”, “Standing In The Rain”, “I Hate The Music” before finishing his set with a quick reference to Vanda and Young launching into “Yesterday’s Hero”. Russell Morris hit the stage moving straight into some recent work with “Black Dog Blues” from his smash album Sharkmouth. 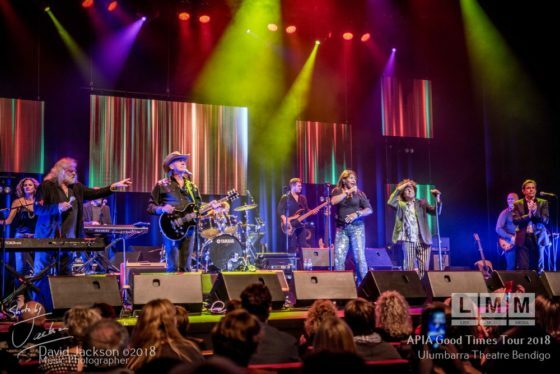 Dylan’s classic “All Over Now Baby Blue” covered by Morris in the late 60’s, “Sweet Sweet Love” and the Molly Meldrum produced “The Real Thing” were all met with maximum crowd participation. A short interval and a man Australia now claims as our own Leo Sayer sat centre stage and sang with the audience “One Man Band” was echoed all around the theatre. “Long Tall Glasses”took the audience back to 1975. Marcia Hines transported us all back to the disco era of the 70’s with the Gloria Gaynor classic “Never Can Say Goodbye” before introducing her own hit “Your Love Still Brings Me To Your Knees”. A return of all artists together to the stage gave the audience a montage of classics. 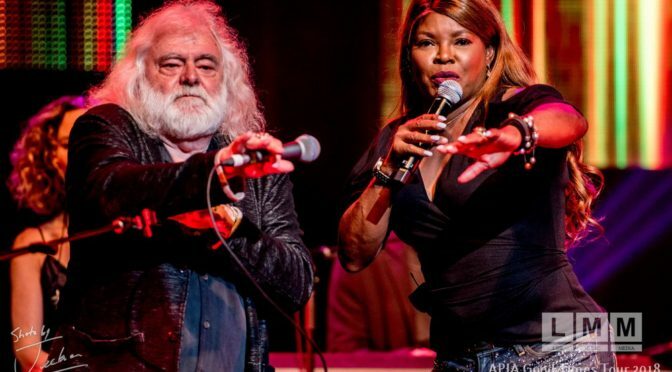 The party started when all five superstars collaborated on one each of their own classics, Brian Cadd started with “A Little Ray of Sunshine” followed by Russell Morris with “Hush”, JPY’s “Love Is In The Air”, Leo Sayer’s “You Make Me Feel Like Dancing” and Marcia Hines with “You”. The crowd responded with everyone up on their feet dancing to hit after hit. Dragon’s “April Sun In Cuba” ended the even as the final encore. As it tours throughout Australia this is one show well worth catching.